Sirens | Learn about Greek Mythology,Greek gods,Greek mythology stories! Sirens in Greek mythology were goddesses associated with water, love and death. More precisely they act as sea demons. Depicted with a human female head and raptors body . In the prevailing scenario they are considered daughters of the river god Achelous and the Muse Melpomene (Apollodorus) or Terpsichore (Apollonius Rhodius) or Steropi. In another version they are considered to be daughters of the sea god Poseidon and their mother was Chthon (Earth). Usually they were two figures Aglaopi (brilliant in appearance) and Thelxiepeia (charming in reason) or three Parthenopi, Nicosia (white substance) and small (Clear Voice) or Aglaofonos, Molpi (melodious voice) and Thelxinoi (beautiful mind) by Hesiod. Other names given to them are Thelxiopi (charming view) and Peisinoi (persuasion of the mind). According to the myth, the Sirens were sea nymphs (Naiads) companions of Persephone. 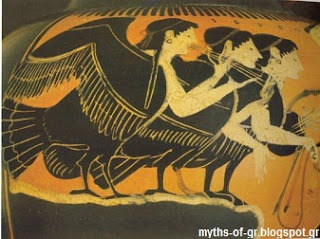 When the Persephone was kidnapped by Hades her mother Demeter gave them the body of birds to help her in the search. When they could no longer able to find her they settled down on an island where with their beautiful song attracted the sailors of the ships which were approaching the area and then caused their destruction. Are first mentioned in the Odyssey as residents on the island of Anthemoessa at the Tyrrhenian Sea, at the Strait of Messina between Sicily and Calabria. Odysseus had been told by Circe about the charming song with which they traped the unsuspecting travelers, who approaching either forgot their destination or were mangled by them, so he ordered the whole crew to put wax in their ears not to hear the song of the Sirens, and he asked to tie him to the mast so when he heard their song would not be dragged into charm. Before Odysseus only the Argonauts had managed to go through their area when Chiron had warned Jason to get with him Orpheus who with his song surpassed in beauty the sirens and finally managed to escape without loss. 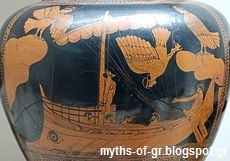 The island of the Greek mythology Sirens or Seirinousson is not precisely identified nor mythological. Various scholars have proposed numerous locations. However,the prevailing view was on the beach in Campania near Naples.